As a photographer and filmmaker, Raymond Depardon’s work is characterised by a particular sensitivity to questions of framing, stillness, light, depth, silence, absence, and temporality. By the late 1970s – and especially with the publication of Notes (1979) – he had become disillusioned with mainstream photojournalism, turning instead towards a looser, more subjective and indirect style, and from ‘photographie-document’ to ‘photographie-expression’. In this context, reality was no longer a phenomenon that could be captured or framed – decisively – but rather it became something to be caught unawares, revealed through a way of seeing rather than through this or that technology of looking. Subsequently, Depardon’s work has been associated with images of emptiness, abandonment, and isolation – deserted places and lost time; and regardless of whether his subject matter involves the French countryside, the African desert, psychiatric or other juridico-legal institutions, the mystery of the real is approached tentatively, and with a clarity that is free from certainty. New York, N.Y. was shot in 1985, and released the following year. Originally intended as a feature-length documentary, Depardon gradually became frustrated with the production; progress was slow, time was running out, and he had promises to keep. He had every reason to be optimistic about this project: he understood New York, and his recent documentaries had been successful. He had spent the winter of 1980 in the city, wandering around Manhattan, taking random – ‘blind’ – street photographs, and shooting some occasional 16 mm footage. Ultimately, this sojourn would contribute two works to his œuvre: Manhattan Out (a collection of some photographs taken at this time); and Dix minutes de silence pour John Lennon (1980), a short documentary treatment of the Central Park vigil for Lennon. In July 1981, he was back working in the city, completing a commission for Libération, which required him to send one captioned photograph back to the newspaper every day for a month; and between 2nd July and 7th August, he duly completed the series of thirty-three ‘photo-texts’ for this project, titled Correspondance New-Yorkaise. Between 1981-85, he also made two internationally acclaimed films (Reporters (1981), and Faits divers (1983)), and his first feature film, Empty Quarter, Une femme en Afrique (1985). He returned to New York briefly in 1983, when completing Le Désert américain, a major photography assignment for Magnum. Significantly, this project was dedicated to his friend and the editor for most of his films up to that point, Olivier Froux, who had died with his wife in an accident in October 1982. Given that Depardon was also now incorporating more autobiographical elements into his photography, perhaps New York, N.Y. might also be understood as a film shaped by grief, a film both abandoned and retrieved by the work of mourning. New York, N.Y. comprises a triptych of black and white sequence-shots, with a separate – congruous rather than synchronous – soundtrack added later. The opening and closing sequences were shot from inside a Roosevelt Island tramcar; the first as it travels into mid-town Manhattan just before dawn, and the second as it returns at night. In both sequences, the Queensboro Bridge (59th Street Bridge) dominates the mise en scène, patterning the skyline with its lattice of criss-crossing girders and joists, framing the traffic on its upper and lower lanes. 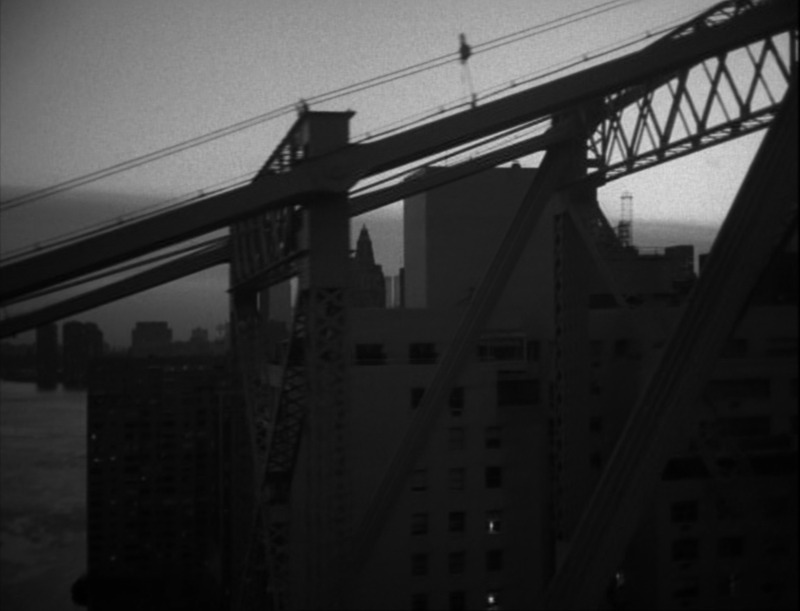 The camera position is fixed, with the tramcar itself acting as the dolly, ascending alongside the bridge and above the East River in the opening sequence, and then descending with it in the closing one, floating above the river and the busy streets on the other side. The middle sequence in the film is again shot from a fixed camera position, although this time it is set at eye-level on a (Manhattan) street corner, observing commuters and passers-by as they make their way hither and thither. In each of the sequences, the play of light and tone, and the vistas that appear and disappear, suggest the excessive iconicity of New York, how every photograph or film sequence of that city is already a quotation. Inevitably, Depardon’s images of the bridge, and the city by night, dusk, and dawn, invokes a history of photography that includes the work of figures like Eugene de Salignac, Alfred Stieglitz, Todd Webb or Robert Frank (‘Downtown New York, 1954’), while the middle sequence calls to mind New York’s culture of street photography, a culture that had revolutionised postwar photojournalism by rejecting compositional balance, formal precision and decorum in favour of more immediate, uncompromising and intrusive aesthetic strategies – the style of photography popularly associated with Frank, Helen Levitt, William Klein, and Gary Winogrand. In so doing, the film also invokes a history of cinema, particularly the one that includes Charles Steeler and Paul Strand’s documentary short, Manhatta (1921). In this sense, New York, N.Y. – with the Roosevelt Island tramcar as its governing metaphor – travels between photography and cinema, stillness and movement, day and night, with these relationships as its real subject, rather than New York itself. It also travels between sound and silence, and this relationship – perhaps, paradoxically – is essential to the film’s aesthetic distinctiveness, and achievement. The soundtrack of New York, N.Y. , for example, deploys three forms of silence that complement the film’s visual style: citational, incidental, and metaphorical. Depardon’s sparse, austere soundtrack not only accentuates stillness and the photographic essence of the film image, it also conjures up – cites – the spectre of early ‘silent’ cinema, films such as Manhatta, but also the numerous New York travelogue and ‘exhibition’ films produced at the turn of the century by the Edison Company, or American Mutoscope and Biograph, etc., films that also scanned the cityscape, and its communities. Pace Stanley Cavell: What was given up in giving up the silence of film, in particular the silence of the city? The presence of incidental silence in the film is particularly relevant to the middle sequence, in which the soundtrack has been ‘bleached’ of everything except the sound of different, particular footsteps, an effect that creates an abstract, otherworldly mise en scène. The sound of footsteps can identify an individual, and convey something about them, their immediate existence, and motivations. They can signify temporality, vulnerability, suspense, but in this sequence they seem to resonate into the silence, like heart beats. Finally, and in terms the metaphorical role of silence in New York, N.Y., it is worth remembering (as Depardon does remind us in his brief prologue) that this film was created from something that was lost, or seemingly lost. A deeply autobiographical work, haunted by histories that are as personal as they are cultural, New York, N.Y. has a distinctly elegiac quality to it that transforms its New York into a touchstone of mortality as well as mystery and beauty. Its moments of silence, configured as much by images as sounds, become moments when the film gestures towards another reality, one that is – like this film – simultaneously real and imagined, lost and found. F. Scott Fitzgerald, The Great Gatsby, ed. Ruth Prigozy (Oxford: Oxford University Press, 1998), p. 55.
en collaboration avec Philippe Delarbre et Gérard Pfister (Paris: Arfuyen), 1979. On the relevance of ‘photographie-document/photographie-expression’ to Depardon, see Andrew Stafford’s Photo-Texts: Contemporary French Writing of the Photographic Image (Liverpool: Liverpool University Press), 2010, pp. 85-88. See Des O’Rawe, Regarding the Real: Cinema, Documentary, and the Visual Arts (Manchester: Manchester University Press), 2016, pp. 151-157. Raymond Depardon (with Alain Bergala), Correspondance New-Yorkaise (Paris: Libération/Éditions de l’Étoile), 1981. Raymond Depardon, Manhattan Out (Gõttenberg: Steidl, 2009). Cavell’s question is: ‘What was given up in giving up the silence of film, in particular the silence of the voice?’ See The World Viewed: Reflections on the Ontology of Film (Cambridge, MA: Harvard University Press, 1971), p. 147. Des O'Rawe is Lecturer at Queen's University Belfast. His recent recent publications include Regarding the Real: Cinema, Documentary, and the Visual Arts; and Post-Conflict Performance, Film, and Visual Arts: Cities of Memory (with Mark Phelan). He has published in journals such as Film Quarterly, Studies in Documentary Film, Screen, Quarterly Review of Film and Video, Kinema, Literature/Film Quarterly, and Screening the Past.